Profile: I was interested in knives from a very young age. I suppose it was because my Dad had a bowie/hunting type of knife that I used to play with and was quite fascinated by this knife wondering who made it, how was it made, etc. 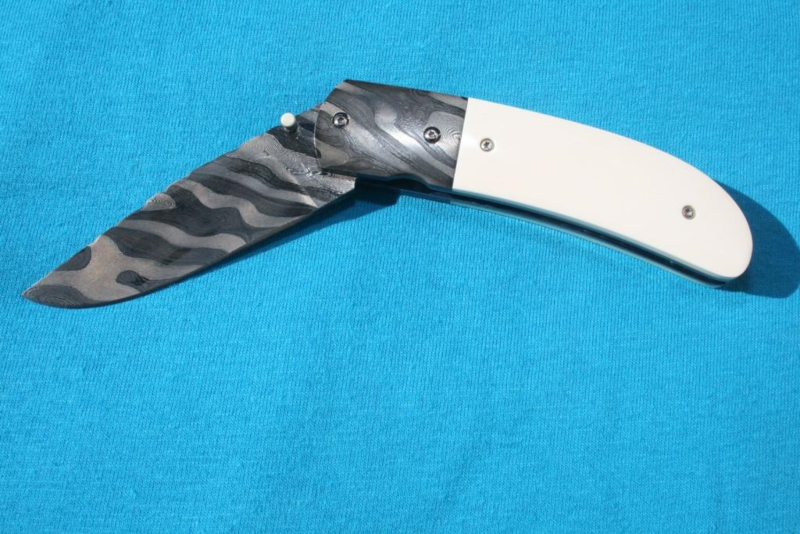 During my growing up years I collected a few magazines with custom made knives in them and every time I looked at them I was in awe at these makers’ knives. I also attended a few knife shows over the years, but it was only in 1999 that I decided to do something about it. I grabbed the list, which the Knifemakers Guild produce of all their members, and contacted the member that stayed the closest to me which happened to be Gavin Dickerson! I asked him to teach me the trade and luckily he agreed. So it came then that in October 1999 I received my first formal lesson on how to make knives. In April 2000 I sold my first two hunting knives to two of my colleagues at work who believed in my skills. From here on my hobby just took off and since then also attended a few Blade Shows in Atlanta. In July 2006 I was accepted into the Guild and my hobby as a knifemaker was truly on track. In the beginning of my knifemaking quest I made any type of knife but lately I prefer to only make high end folding knives. I like working with damascus steel which I source from fellow knifemakers who specializes in making damascus. Handle material is mostly ivory, mother of pearl and any fancy wood that I can lay my hands on. Heat treating I do myself and have since invested in a quality furnace with digital control. All embellishing on my knives are being done by myself with only the tried and trusted needle files as I have no other fancy tooling. I really enjoy my knifemaking hobby and will continue to do so as long as I am still alive and of sound mind, body and soul! These two folders feature damascus blades, with the top folder having double bolsters with the same material as the blade. Handle is Mother of Pearl. 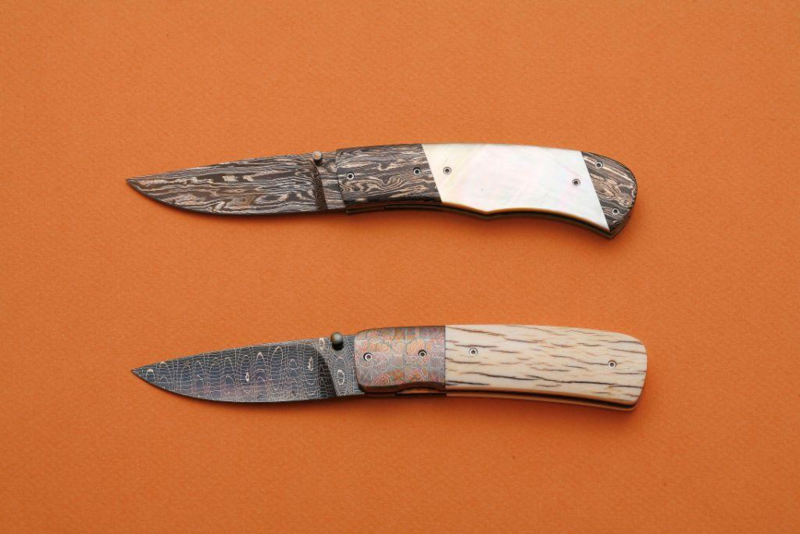 Bottom folder has mosaic bolsters with elephant bark ivory as the handle. Blade and Bolsters, explosion damascus from Ettore Gianferrari. Handle is elephant ivory, with 6AL4V Titanium liners. Blade and Bolster material is Damasteel, from Sweden. This specific pattern is called “Grossen Rosen”. Handle material is Warthog Ivory. Liners are 6AL4V Titanium that has been gold anodized. 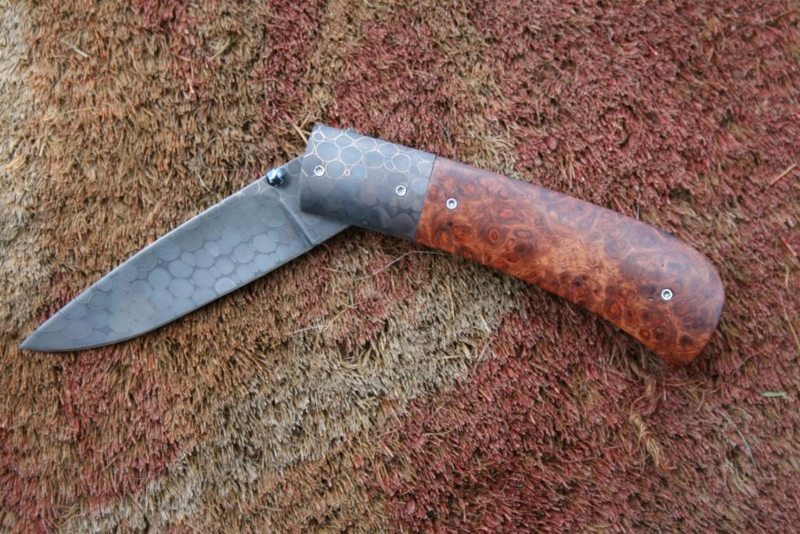 Blade and Bolster material is “Dragon skin” Damascus by Bertie Rietveld. Handle material is stabilized Amboynia Burl.